Don’t let living in a sectional title property stop you from growing your own food! With minimal effort you can grow and harvest fresh sprouts which give you a live enzyme boost and jazz up your salads, soups and sandwiches… Yum! Once the required time is up, secure the cloth over the mouth of the jar with the elastic band and turn the jar upside down to drain (you can do this over the sink by placing your jars on a clean drying up rack. Make sure that the jars are in a warm place but not in contact with direct sunlight as that will fry your little seedlings. Rinse seeds 2-3 times a day and allow to drain. 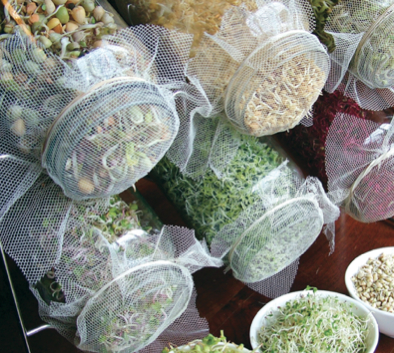 Troubleshooting: If you see mould or slime – throw your seeds/sprouts away and start again. Smaller seeds may be ready in 2 days whilst larger ones may take between 3 and 5 days to sprout. Once ready, rinse and store in airtight container in your fridge ready for use. Use soon after harvesting to avoid them going off. Remember these babies are preservative free! 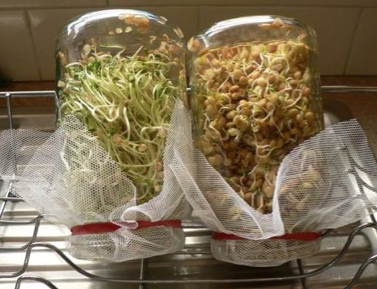 This entry was posted on April 18, 2013 by Paddocks in Gardening and tagged grow sprouts in glass jars, sectional title property.